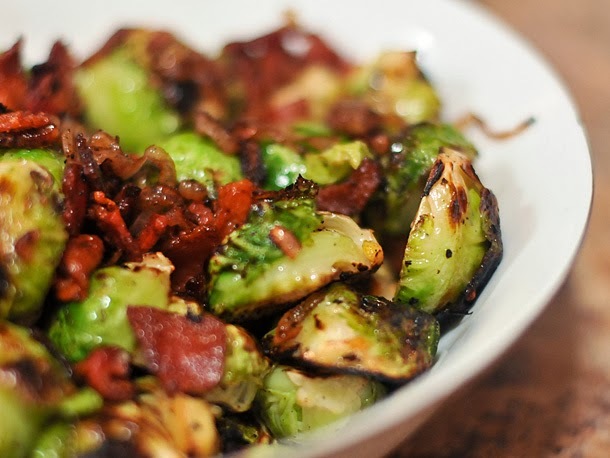 11 Imaginative Recipes to Reinvent the Humble Brussels Sprouts! Normally when I write a food column like this I have made at least a few of the recipes in it, but not this time. Hopefully the opportunity will arise over the holidays to try a few of these in the family menus, but if I get one in I'll feel grateful. WHY? My family are just not fans of most of the cabbage family, especially when cooked. I, however, crave every member often and in large quantities. The latest salad mix I get for myself involves kale and raw Brussels Sprouts - nirvana! When your husband in particular goes to great lengths in front of the kids to explain all the reasons he doesn't like a vegetable, it's sure to have a strong impact. But I have come in recent years to feel that with all the fusion and modern recipes out there, that there must be some way to make Brussels Sprouts that my family can enjoy at least in a small way. Enter the internet and newspaper. What great resources. It all began with an article by Laura Brehaut for Canada.com called Ingredient of the Week: Brussels Sprout. Nine glorious recipes to try - a few with real potential. As someone who grew up with frozen vegetables and at my husbands request, still offer them - I was very excited to give these a try. They are from a variety of sources, so offer a wide range of taste possibilities. Top on the list to try first are - Roasted with Guyere Cheese, the warm salad and the quick saute. Then the top recipe I actually found just yesterday in the Vancouver Sun. Karen Barnaby's recipes have a high success rate for me, so I chose to put it first. Everyone seems to have different taste preferences when it comes to any food, so there is never any guarantee, but the last few of her recipes I have tried were hits with the whole family. Now to see if her take on Brussels Sprouts can bring my family from the dark side into the light and where they can embrace the humble sprout. From Karen Barnaby - Executive Chef and Food Columnist for the Vancouver Sun. Tamari is a dark, and usually wheat-free soy sauce. When these ingredients are roasted together, the tamari and sesame oil lose their distinctly separate flavours and become unified into a rich and roasty blend. 4 tbsp (60 mL) unsalted butter, at room temperature Heat the oven to 350 F (175 C). Cover a large, rimed baking sheet with aluminum foil, then a sheet of parchment paper that has been trimmed to fit. Spread the Brussels sprouts on the baking sheet. Drizzle the tamari and sesame oil over them and toss to coat. Roast, shaking the pan every 10 minutes or so, until the vegetables are crisp and browned, about 30-40 minutes. Remove from the oven and toss with the butter. Bring a large pot of water to boil. Season generously with salt. Trim the ends off of the brussels sprouts and remove the toughest outer leaves. Shred them in a food processor, using the slicing attachment, or slice them carefully on a mandoline or as thinly as possible with a knife. Heat a large skillet over medium-high heat and add the olive oil. Add the pancetta and cook for about 5 to 6 minutes, until fairly crispy and cooked through. Clear some space in the middle of the pan and add the shallots. (If you don’t have enough room in your pan to create space, you can remove the pancetta with a slotted spoon and add it back in when you add the sprouts.) Cook for about 5 minutes, until the shallots are soft. Add the garlic and cook until fragrant, about 1 minute or so. While the shallots are cooking, add the pasta to the boiling water and cook until al dente. Add the brussels sprouts and the chicken broth to the large skillet, season with salt and pepper, and toss all of the ingredients together. (Go easy on the salt initially because pancetta can be quite salty.) Cook, tossing occasionally, until the brussels sprouts are tender but not too soft, about 5 minutes. When the pasta is finished cooking, drain and add it to the skillet. You can add a splash of the pasta water (or more broth) if the mixture seems dry. Add pine nuts, toss everything together, season to taste and serve. While this article was obviously written by one person, there is no chef credit - just the Associated Press. It offers 2 version, only one of which includes Brussels Sprouts - the second can be found at the link provided. In a medium saucepan over medium-high heat, combine the rice and water. Bring to a boil, then cover, reduce heat to simmer and cook for 20 minutes. Remove the pan from the heat, leaving it covered. The rice will not be completely cooked and there will be some water in the pan. Set aside. In a large skillet over medium-high, heat the oil. Add the prosciutto and cook until crisp. Use a spoon to transfer the prosciutto to a plate and set aside. Do not wipe out the skillet. Return the pan to the stovetop over medium-high heat and add the rosemary and onion. Saute until starting to brown, about 4 to 5 minutes. Add the Brussels sprouts and apple OR the asparagus and sun-dried tomatoes. Cook for about 5 minutes, then add the wine and stir vigorously for 1 to 2 minutes to deglaze the pan. Add the rice and any liquid in the pan. Add the chicken broth and stir well. Bring to a simmer and cook, stirring frequently to prevent sticking, until the liquid has thickened and reduced, about 10 minutes. Stir in the cornstarch mixture, then cook for another minute. Top with crisped prosciutto, then drizzle with balsamic glaze just before serving. Alison Ladman writes, “Whatever you do this holiday season, don’t spoil your spread with underdressed vegetables.” In Ladman’s recipe, roasted Brussels sprouts are dressed with Gruyere cheese, pepitas (pumpkin seeds) and dates. Spread the Brussels sprouts on a rimmed baking sheet. Drizzle with the olive oil and toss to coat. Season with salt and pepper. Roast for 30 to 40 minutes, or until tender and well browned. Sprinkle with the shredded cheese and return to the oven for 10 minutes. Transfer to a serving dish and sprinkle with the pumpkin seeds and dates. Adapted from Momofuku by David Chang and Peter Meeha, this recipe was found on Food 52 and notes it is by Genius Recipes. It will add a much-needed spark to your winter diet and any holiday spread. Combine the vinaigrette ingredients, cilantro stems and mint in a bowl, and set aside. Peel away any loose or discolored outer leaves on the brussels sprouts, trim the dry end of the stems with a knife, and cut the sprouts in half. Cut any especially large ones in quarters. Do not wash, especially if frying the sprouts. If roasting, and you must, dry very well. When ready to serve, divide the brussels sprouts among four bowls (or serve it all out of one big bowl), top with the dressing to taste and cilantro leaves, and toss once or twice to coat. No obvious credits for this article either - my assumption based on the photo credits is the Almond Board of California. Roasting brussels sprouts brings out their nutty flavour. This side dish is perfect to serve for winter entertaining. The inclusion of pomegranate seeds gives it a festive flair. Topped with toasted almonds, this colourful and flavourful dish would be perfectly at home on a holiday table. Place rack in the centre and upper third of the oven. Heat oven to 190 C (375 F). Trim bottom off each sprout and slice in half or in quarters; place sprouts on 2 rimmed baking sheets. Drizzle with olive oil and sliced almonds. Sprinkle with salt and pepper. 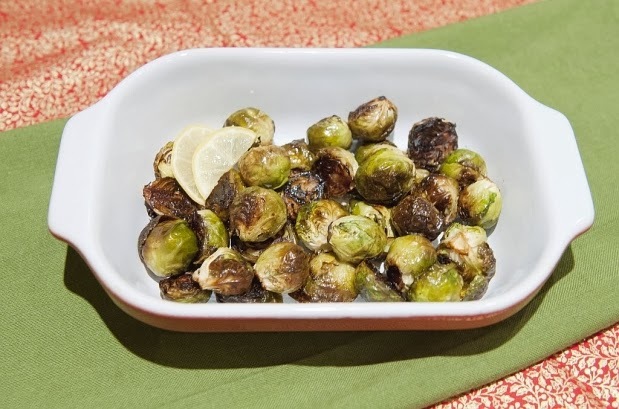 Roast until tender and golden brown, 35 to 40 minutes, removing pans once or twice during baking to stir and toss brussels sprouts. Transfer sprouts to a large bowl and toss with pomegranate seeds. Season with salt and pepper to taste. Serve warm. Slice Brussels sprouts as thin as possible, by hand or with a mandolin. Toss lightly with almonds, eggs, cheese, chives and preserved lemon. For dressing combine lemon juice with salt, pepper and olive oil. Toss with salad. Adjust seasoning if necessary. Denis Cotter, author of the vegetarian cookbook For the Love of Food, serves these sprouts with mashed potatoes laced with smoked cheese for a vegetarian meal. The maple syrup is a Canadian/Irish fusion touch he must have picked up in Stratford, Ont., where he spends a lot of his time. Blanch Brussels sprouts in boiling water for 5 minutes, drain, rinse in cold water and pat dry. Heat oil in a large heavy skillet and add onions. Cook about 2 minutes. Add Brussels sprouts and cook about 5 minutes. Add garlic, tomatoes, orange peel, maple syrup and soy sauce, cover and cook 2 minutes longer. Taste and season with salt and pepper if necessary. Raw, thinly sliced Brussels sprouts, romaine lettuce, and green onions are tossed with crisp bacon and pecans, and a warm, mustard-garlic vinaigrette in this salad recipe from the ATCO Blue Flame Kitchen. Trim off the ends of stems of Brussels sprouts; discard ends. Cut Brussels sprouts in half lengthwise and then thinly slice crosswise. There should be about 2 cups (500 mL). Combine Brussels sprouts, lettuce and green onions in a bowl; set aside. To prepare dressing, cook bacon and pecans in a medium frypan over medium heat until bacon is browned and crisp. Remove from heat. Remove bacon and pecans with a slotted spoon; drain bacon and pecans on paper towels. Drain off all fat from frypan. Return frypan to low heat. Add oil, vinegar, mustard and garlic; cook, scraping to loosen browned bits, for 30 seconds. Return bacon and pecans to frypan. Stir in salt and pepper. Pour dressing over Brussels sprouts mixture and toss to coat. Serve immediately. The Tamales — chefs Sue Fenniger and Mary Sue Milliken, the co-hosts of their own show on the Food Network once upon a time — slice the sprouts very thin, then quickly sautee them. 3 to 5 minutes in the pan and they’re good to go. This recipe has turned haters into believers over and over again. Heat the oven to 350°F. Put the walnuts in a pie plate and toast them in the oven for 8 to 10 minutes, or until they are fragrant and are a shade darker. 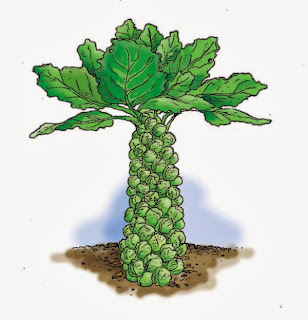 Trim the Brussels sprouts and discard any damaged outside leaves. Use a food processor fitted with the thin slicing blade to shred the sprouts. In a large skillet over medium-high, heat the oil. Add the sprouts and lemon zest, then reduce the heat to medium. Cook, stirring, until crisp tender, about 5 minutes. The pan will seem very crowded in the beginning, but the Brussels sprouts will shrink down quickly. Season with salt and pepper, 1 to 2 tablespoons of the lemon juice, and the walnuts. Serve right away. A bonus recipe from A Little Piece of Sunshine. 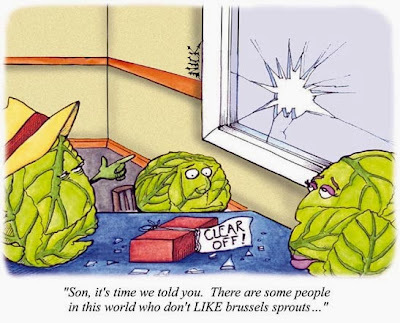 Don’t like Brussels sprouts? This recipe just might change your mind about these mini-cabbages. Add remaining tablespoon of olive oil and butter to the pan. After the butter has melted, add the sprouts and cook for 3 minutes, just until the sprouts have started to brown. Add the bacon back to the pan and toss gently. Season, to taste, with salt and pepper.